Senior India Private Limited is a UK based MNC with its head quarter in London and registered in London Stock Exchange. 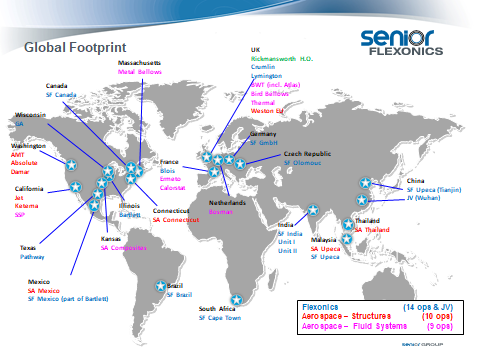 Senior has operations in 14 countries and has 33 manufacturing facilities worldwide. Senior designs, manufactures and markets high-technology components and systems for the principal original equipment producers in the worldwide aerospace, defence, land vehicle and energy markets. Senior India Private Limited is a 100% subsidiary of Senior Plc UK. Senior India was established in 1993 under the name of Inalsa Flexonics that was taken over by the Senior Group in 1998. Senior India is a leading manufacturer of Automotive Flexible Exhaust Connectors (Bellow and Interlock types), SS Bellows. Senior India has also introduced engine products viz. EGR coolers, Fuel rails, EGR tubes, Turbo Oil Drains, Turbo Oil Feeds etc. in 14 countries and has 33 manufacturing facilities worldwide. Senior designs, manufactures and markets high-technology components and systems for the principal original equipment producers in the worldwide aerospace, defence, land vehicle and energy markets. Copyright Senior Auto| All Rights Reserved.